Patriot Pest Management offers the very best service, products, and guarantee in the industry at fair prices. That’s the Patriot Difference. We use both treatments—Advance Termite Baiting System and Termidor Liquid Termiticide—when dealing with active termite colonies to ensure the best short & long term treatment for the elimination of termites. With Termidor, you’ll see results immediately with complete destruction of the colony within 90 days. With the Advance Baiting System in place you’ll never have to pay to re-treat your home again as long as you continue our annual renewable contract. Most pest control companies use single treatment solutions which require you to re-treat the exterior of your home with Termidor after several years. The need for these “booster” treatments is due to the breakdown of liquid termiticides over time due to excessive rain, soil movement, foundation settling, etc. Unfortunately, this can cost you thousands of dollars over the course of you owning your home. With the use of the Advance Termite Baiting System (which provides a long-term defense against termite activity) and Termidor (a fast working liquid), Patriot Pest Management does not require this re-treatment as long as you own your home. This saves you time and money—and hassle. The company you choose if every bit as important as the treatment. When choosing a pest control company for termite extermination, there are several factors to consider. First, review any contract closely to ensure companies will stand behind their guarantee, including repairing any damages caused by termites. Secondly, confirm the contract is transferable upon the sale of your home. Finally, verify the company maintains a good record with the Department of Pesticide Regulation in your state. Patriot Pest Management meets and exceeds all of these qualifications. 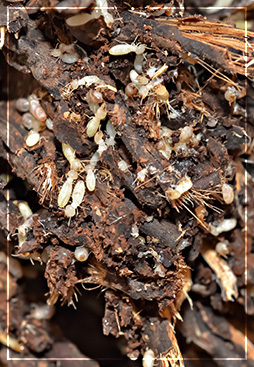 We offer three options for termite treatment. Each of these requires a contract which provides complete termite solutions. Utilize the Advance Termite Baiting System to protect against and provide damage repair coverage for both the Eastern Subterranean Termites (the most common of all termite species) and the Formosan Termites which, although not as common in South Carolina, have been documented along the coastal regions and in York County (Rock Hill, SC) and Rutherford County in North Carolina. If and when they become a threat to your home you will be covered. This contract is transferable to the new owner upon the sale of your property (at the discretion of Patriot Pest Management) and does not require a “booster” treatment. A Termidor only treatment plan, this contract also covers against Eastern Subterranean Termites. It does not require “booster” treatments upon sale of your property. Option three provides for service of existing infestations only. This contract does not offer damage repairs if the following conditions exist: 1) Extensive damage due to existing problems at time of treatment, or 2) Circumstances that prevent proper treatment of your property. This contract covers re-treatment only. We understand the cost of termite treatments can be expensive. Don’t waste your money on lousy service or sub-standard products. Patriot Pest Management offers the very best combination of services and products at competitive prices. We proudly stand by our guarantee to provide you with exceptional service. Call 1-866-640-PEST or click here to request an inspection.